Continuing in a string of Apple retail thefts, a bold band of burglars earlier this week made off with 19 iPhones worth some $13,000 from a busy store in Natick, Mass., according to local reports. As reported by The MetroWest Daily News, police said the Apple Natick Collection outlet was the scene of a speedy burglary on Tuesday perpetrated by a group of seven unidentified individuals. Described as a "pack," the suspects are believed to be teens or young men and women. "We've been hearing about this," said Natick police spokesperson Lt. Cara Rossi. "They're traveling in packs. They brazenly walk in together and steal." A video of the incident posted to the Natick Police Department's official Facebook page on Thursday suggests a reasonably well coordinated operation. Wearing hoodies, the roving gang can be seen entering the mall at around 7:15 p.m., making a beeline straight for Apple. Once inside, the suspects gathered around display tables at the store's entrance —iPhones are usually placed prominently on the sales floor to lure in passersby —ripped 19 iPhones from their security tethers and scrambled out. The heist was over in less than a minute. A post accompanying the Facebook video says the group might be connected to a similar theft last week in the town of Hingham, about an hour's drive from Natick. The incident follows a rash of Apple retail thefts in the U.S., the most recent being cases in New York City. 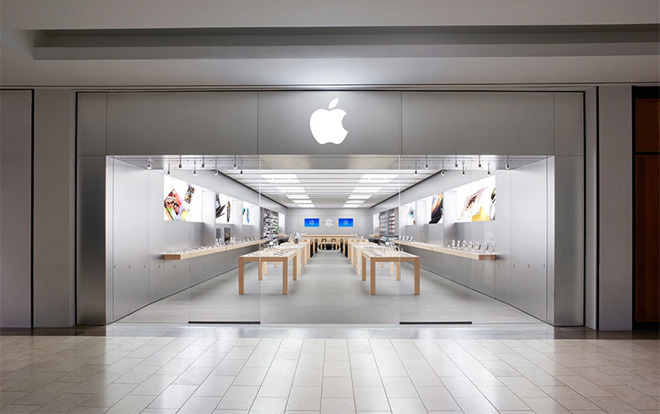 More sophisticated than the Natick outfit, swindlers in New York disguised themselves as Apple employees to gain access to back-of-store repair rooms. In June, a lone suspect pilfered 19 iPhones from the SoHo store, while a gang of three hit the Upper West Side location twice this year using similar tactics. The latter group of imposters made off with a total of 67 iPhones.